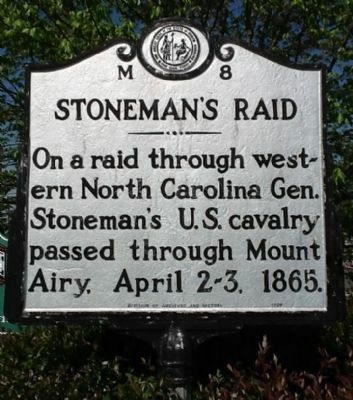 On a raid through western North Carolina Gen. Stoneman’s U.S. cavalry passed through Mount Airy, April 2-3, 1865. Location. 36° 29.863′ N, 80° 36.502′ W. Marker is in Mt. Airy, North Carolina, in Surry County. 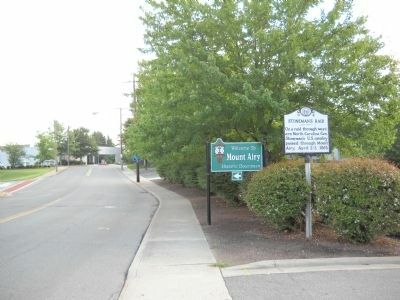 Marker is on Rockford Street, on the right when traveling north. Touch for map. Marker is in this post office area: Mount Airy NC 27030, United States of America. Touch for directions. Other nearby markers. At least 8 other markers are within 6 miles of this marker, measured as the crow flies. The Andy Griffith Show (within shouting distance of this marker); 90 MM Gun Tank M47 Patton (approx. 1.4 miles away); Siamese Twins (approx. 3.3 miles away); Patrick County / North Carolina (approx. 4.8 miles away in Virginia); Stuart's Birthplace (approx. 5.4 miles away in Virginia); Laurel Hill (approx. 5.4 miles away in Virginia); Historic Roadbed (approx. 5.4 miles away in Virginia); The Stuart Graveyard (approx. 5½ miles away in Virginia). Touch for a list and map of all markers in Mt. Airy. 1. 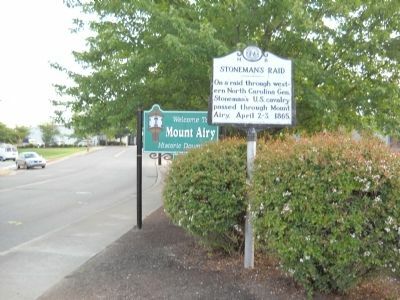 Stoneman’s Raid, March 23 – April 26, 1865. — Submitted April 14, 2012, by Michael C. Wilcox of Winston-Salem, North Carolina. Credits. This page was last revised on June 16, 2016. This page originally submitted on August 6, 2010, by Bill Coughlin of North Arlington, New Jersey. This page has been viewed 864 times since then and 8 times this year. Last updated on April 14, 2012, by Michael C. Wilcox of Winston-Salem, North Carolina. Photos: 1. submitted on May 4, 2012, by Michael C. Wilcox of Winston-Salem, North Carolina. 2, 3. submitted on August 6, 2010, by Bill Coughlin of North Arlington, New Jersey. • Craig Swain was the editor who published this page.